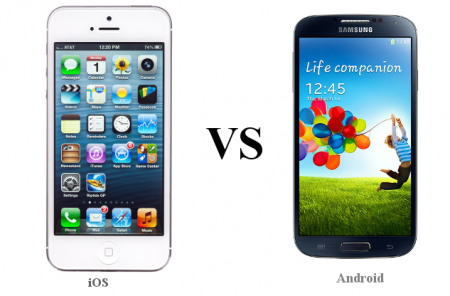 Mobile app developers should should Android and iOS? Home » Mobile App Development » Should mobile app developers learn to code in Android if already know iOS? There are many opportunities awaiting for mobile app developers, specially iOS ones. However, you will be missing over half of these opportunities if you don’t know how to programme in Android. The reason for this is that most of the applications being developed and of the projects being hired through platforms like Yeeply want to be available on Android devices, as these enjoy the most widespread use. What data tells mobile app developers about coding Android & iOS? Recent studies on which are most used mobile devices corroborate what we were previously discussing. One of these studies is the latest Mobile Overview Report, recently published by Scientiamobile −a company dedicated to collecting and sharing information on the use of technological devices. However, Apple is still North America’s leading brand and iPhones are still the most popular devices there. In other geographic areas it’s not the same. In fact, it’s rather the opposite. Asian users prefer larger screens, but within the size range of smartphones. Among the most popular devices we come across in this continent is a device running on Android: Samsung Galaxy S4. According to the aforesaid report, Android leads the market with a share of 77%, while iOS’s market share is of 14%. Europe’s market is more divided and there is a larger variety of devices. For instance, iPhones compete in popularity with Samsung Galaxy devices. Although on the whole, Android has a market share of 62% if we focus on the operating system. This clearly exceeds iOS’s 28% share. Also noteworthy is that Europe is one of the places where RIM OS −BlackBerry’s operating system− has a significant presence with 2% of the market’s share. As for South America, this geographic area is perfect for any freelance mobile app developer who knows how to programme in Android. Stunningly enough, Motorola’s Moto G device leads the market with a surprising 17% of the market’s share, while the remaining devices cutting the mustard are several Samsung Galaxy models. There’s no point in denying that South America’s market is led by Android (86%), while Apple has almost lost the battle (7%) with a share that is similar to that of scarcely used operating systems in Europe such as Windows Phone (7%). Is it necessary to know Android code? We must make it clear that it will never be completely compulsory or required to know how to programme in all operating systems. In fact, it’s almost impossible unless you’re an absolute programming genius and have an excellent memory. If this is not the case, you will most likely have to specialise a bit. When making this decision, many programmers often choose to focus on the operating system that yields the higher return on the investment to develop the apps. That’s why many programmers choose to become iPhone developers, as users of these devices are generally more likely to pay for apps. But is it the right option? It’s not completely true that Android is the absolute king among operating systems. Actually, things are more complicated than just analysing the use and the number of mobile users when it comes to an app’s return on investment: we will have to analyse our target mobile user and act accordingly. Therefore, it’s not true that an app that is not available for Android will be unsuccessful. What’s true is that an iOS user is more likely to pay for apps and to have a higher purchasing power. Therefore, he will also be more likely to spend money on in-App purchases and downloads. On the other hand, Android mobile users have a clear preference for free apps, making it a good idea to opt for other business models and programme in Android accordingly. Thus, it’s desirable not to limit ourselves to only knowing how to programme in iOS and rather know also how to programme in Android. In addition to this, we must master both iOS and Android app development. In this article, he discussed the advantages for any developer who −in addition to being an iOS developer− is also an Android mobile app developer. Programming consists in programming: we shouldn’t forget this. And the logic behind programming will still be there regardless of whether we develop apps for iPad, iPhone or Android. The point is that knowing how to programme on both platforms is much easier than it may seem, since the concepts that we will be dealing with are often the same or very similar. Moreover, programming languages themselves are not so different, even taking into account the recent arrival of Swift for iOS. In short, it can be a very good idea to learn how to programme in Android or to improve your programming skills in such operating system. The main reason is that learning and mastering this operating system will not pose a big problem for you. The second reason is that it will give you access to those apps and app projects that require an Android mobile app developer (which are the vast majority, by the way). The third reason −last but not least− is that you will get to see the world of apps from the other perspective. It will open for you a new perspective, a new way of thinking and conceiving projects, and therefore you will be able to estimate the budgets for mobile app projects better. If you have mastered programming in iOS and you also know how to programme in Android, you can still go further down the rabbit hole. Rivalry is not fierce among mobile app developers in operating systems such as Windows Phone or Rim OS, as these are not that widely used. But someone has to develop apps for Windows Phone or Blackberry devices, right? Why not you?